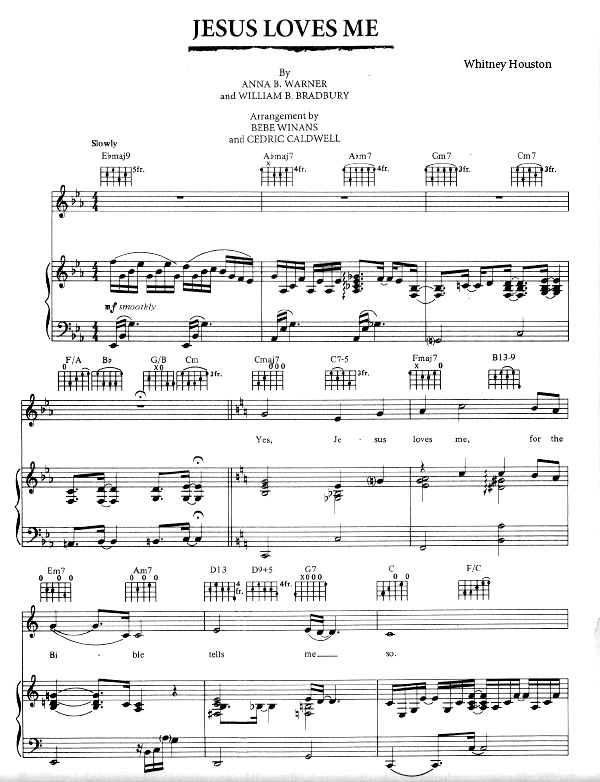 “Jesus Loves Me Sheet Music” by Whitney Houston, “ Jesus Loves Me Sheet Music” for Piano / Vocal/ Guitar Chords , Original key: Eb Major, number of pages sheet music PDF: 6, Video and Lyrics song Jesus Loves Me Sheet Music. “Jesus Loves Me’” is a Christian hymn written by Anna Bartlett Warner (1827–1915). The lyrics first appeared as a poem in the context of an 1860 novel called Say and Seal, written by her older sister Susan Warner(1819–1885), in which the words were spoken as a comforting poem to a dying child. The tune was added in 1862 by William Batchelder Bradbury (1816–1868). Along with his tune, Bradbury added his own chorus “Yes, Jesus loves me, Yes, Jesus Loves me…” After publication as a song it became one of the most popular Christian hymns in churches around the world, especially among children. Whitney Houston in 1992 from The Bodyguard Soundtrack. Jesus Loves Me Sheet Music Whitney Houston.